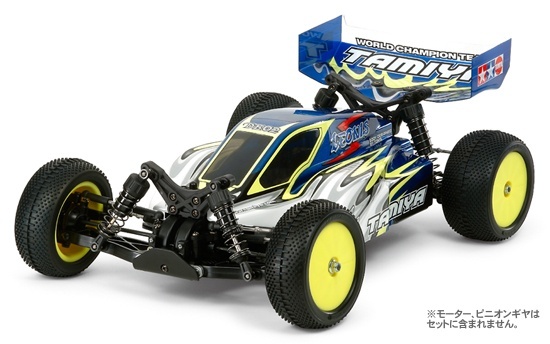 【 Tuner-Styled Off-Road Racer 】　This 1/10 scale R/C buggy Leonis features the newly-designed DB02 chassis, which has a highly-efficient shaft-driven 4WD system and excellent controllability thanks to a horizontally-positioned motor near the center of the chassis. It also features an aerodynamic body shell which was designed by famous Japanese racing team and tuning firm, TOM'S. The "cab forward" body follows design trends found on actual race cars to reduce drag as well as direct smooth airflow to the rear wing to further enhance the machine's performance. 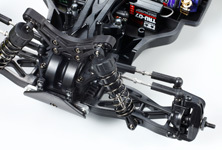 【 Unique Shaft-Driven 4WD Layout 】　The well-balanced DB02 has a drivetrain design which utilizes four bevel gears to transmit the motor power to the front and rear gearboxes via propeller shafts. 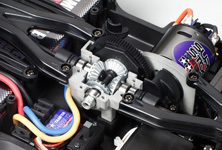 A highly durable one-piece die-cast motor mount holds the motor and spur/bevel gears while front/rear enclosed gearboxes feature ball differentials which utilize the same inch-sized diff balls as those used in the high-end TRF502X. 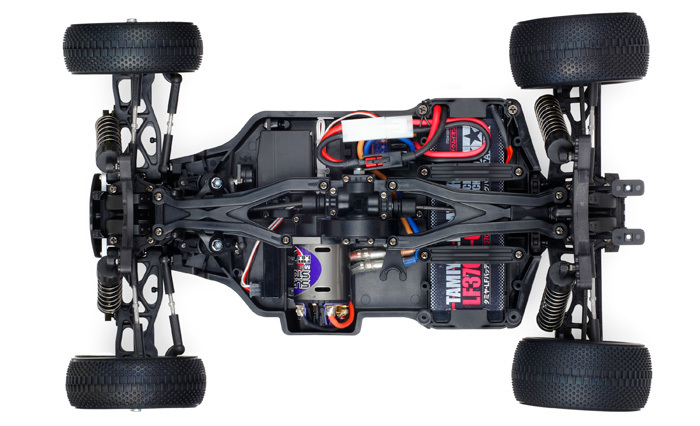 The proven 4-wheel double wishbone suspension from the DB01 is equipped with CVA shock units. A wide range of existing DB01 Option Parts are also compatible with the DB02 to enable fine setting adjustment. Proven suspension from the DB01 is equipped with CVA shock units. 4 metal bevel gears housed in the one-piece die-cast motor mount transmit motor power to propeller shafts. 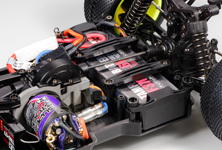 Battery pack is positioned at the rear for excellent chassis balance. Both straight and separate battery packs can be used. The information on this page is current as of Feburuary 2, 2012.